This is the translation with word-for-word meanings to the original Sanskrit. It has an analysis and application to all except the last three verses. No details are spared in the discussion about the transmigration journeys taken by a soul. The journey through physical existence and hereafter and then back into this world, repeatedly, is neatly and precisely described by a siddha from a higher dimension. The soul with the effect-energies from its socially-acceptable and criminal acts, travels to the hereafter where it is fittingly rewarded either in a heavenly world or a hellish place. Then it returns to this earthly planet and becomes adapted as an infant of parents. Anu Gita is intense. It is Krishna’s action thriller. 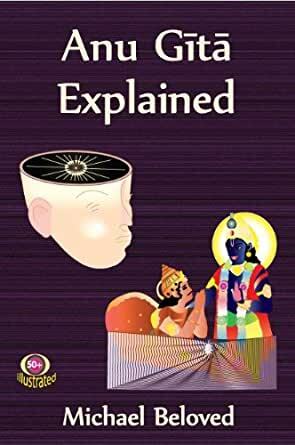 Unlike the Bhagavad Gita where He explained many topics about the application of yoga proficiency to social involvement, the Anu Gita begins with an inquiry into the nature of the individual being and its transmigration between the physical world and the astral existence. There is no drifting away from the topic. Krishna did not stress his divinity and supremacy as in the Bhagavad Gita. He simply quoted a discourse which occurred between a perfected siddha and Kashyapa.